Toyota Motor Corporation (TMC) has been developing and marketing a range of specially adapted “Welcab” vehicles, in response to Japan’s ageing population. 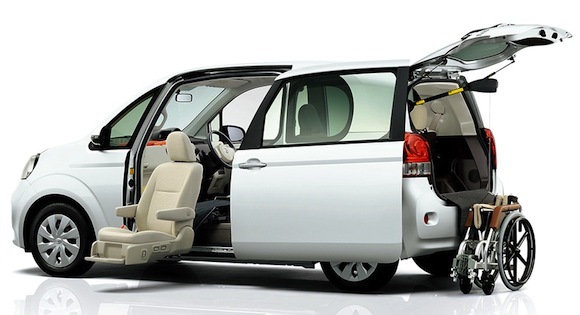 Toyota Welcabs – for elderly and disabled people, feature modifications ranging from lift-up passenger seats, to ramps for easier wheechair access. Toyota will showcase them at the 40th International Home Care and Rehabilitation Exhibition in Tokyo from the 18th to the 20th of September. Toyota will exhibit eight vehicles from the Welcab series, including a line-up of hybrids. Among them will be the the distinctive Corolla Fielder estate – the Welcab variant of which comes with a rotating and sliding passenger seat. The ingenious Toyota Human Support Robot, unveiled in September last year, will be whizzing around as well. The robot has been developed to support independent living for those with limited arm or leg mobility and is one of four types of Personal Assist Robots that are currently being developed by Toyota. The 40th International Home Care and Rehabilitation Exhibition is being held at the international Exhibition Centre in Koto Ward from the 18th to 20th of September and is the largest trade show of its kind in Japan. Further information about Toyota’s range of Personal Assist Robots is available here.